Like many automotive manufacturers, Humber began as a bicycle company. Founded as such in 1868 by Thomas Humber, their first car didn’t appear until 1898, a three-wheeler. Four-wheelers appeared in 1901. “Humberette” was applied to light (single-cylinder) Humbers in 1903 and 1904 and then it went missing until after 1910. The cyclecar fad was sweeping the U.K. in the early teens and Humber eagerly opted in, bringing the Humberette name back from the great beyond for their v-twin powered cyclecars, like the one you see here. This has a 996cc V-Twin making eight horsepower. Unlike most of its competition, this cyclecar has shaft drive, as Humber was not a fan of the much more common chain drive. Humberette was not technically its own marque but the cars are often referred to as if they were. The Humberette name disappeared again at the start of WWI. The Humber name lasted until 1976, being killed during the Chrysler Europe fiasco. This car was restored at some point and has seen little use over the last quarter century in the hands of its current owner. The pre-sale estimate is $17,000-$22,000. For the complete description, click here and for more from Bonhams at the National Motor Museum, click here. 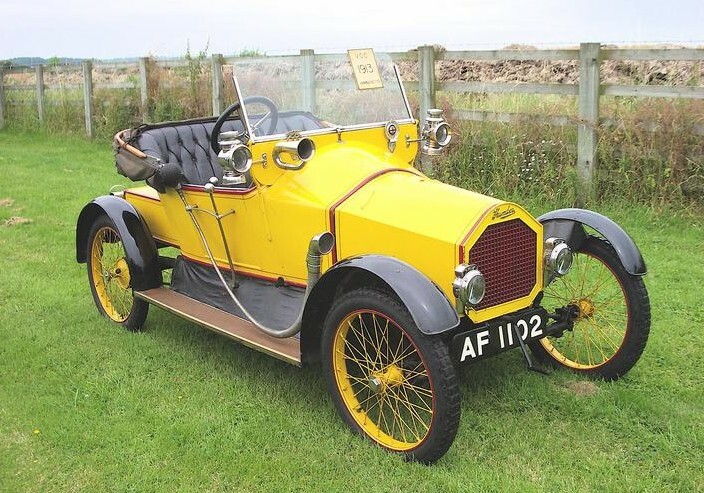 This entry was posted in Uncategorized and tagged 1913, 8hp, auctions, Bonhams, cars, classic, classic cars, cyclecar, humber, humberette, two-seater by classiccarweekly. Bookmark the permalink.